The giant Sunday-funnies pages (Valiant ran only on Sundays) gave Foster a huge canvas upon which he was able to limn epic swordfights, stunning scenes of pomp and pageantry, and some of the most beautiful human beings--male and female--ever to appear in comics. And he matched his nonpareil visual sense with the narrative instincts of a born storyteller, propelling his daring young hero from one crisis to another with barely a panel to catch one's breath. 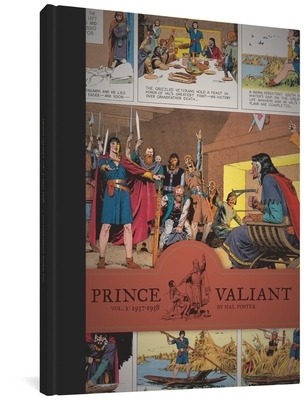 Prince Valiant has previously been widely available only in re-colored, somewhat degraded editions (now out of print and fetching collectors' prices). Thanks to advances in production technology and newly available original proof sheets, this new series from the industry leader in quality strip classics is the first to feature superb restored artwork that captures every delicate line and chromatic nuance of Foster's original masterpiece. Comic strip aficionados will be ecstatic, and younger readers who enjoy a classic adventure yarn will be bowled over. Volume One is rounded out with a rare, in-depth classic Foster interview previously available only in a long out-of-print issue of The Comics Journal, as well as an informative Afterword detailing the production and restoration of this edition. Nominated for a 2010 Will Eisner Comic Industry Award (Best Archival Collection/Project: Strips).